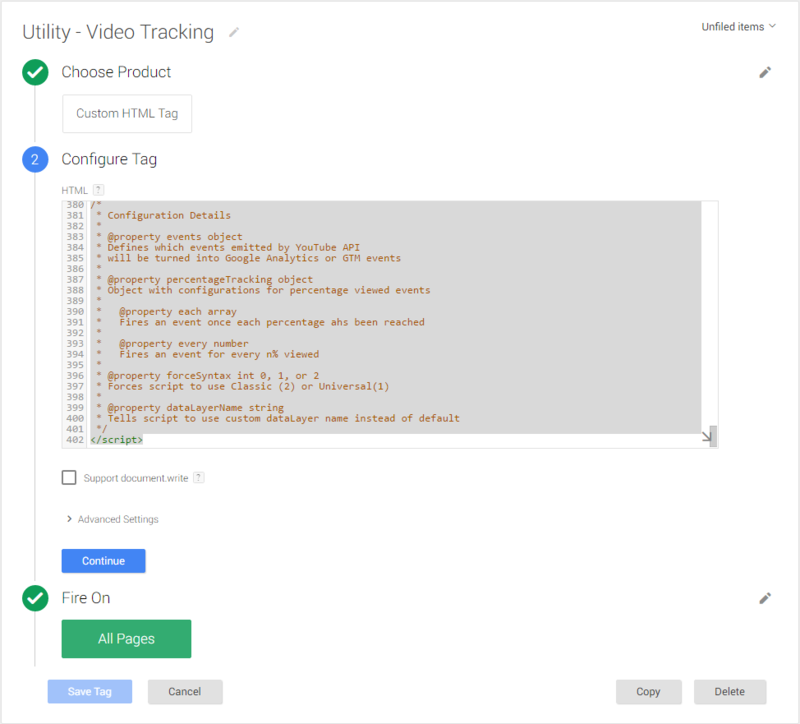 Tracking YouTube videos in Google Analytics via Google Tag Manager is not a trivial thing. Previously, I have been using the method proposed by CardinalPath and it works pretty well for most people. However, I needed a bit more flexibility; e.g. I need to track not only embedded videos but also videos loaded dynamically. This could be videos loaded in a lightbox popup. In my case, videos loaded via the Magnific Popup script. When looking for a solution I stumbled upon Simo Ahava’s blog. In his post on the tracking YouTube videos, he shows how to extend a solution proposed by LunaMetrics to be able to track pop up and dynamically loaded videos in general. To get the details on what this script does, pay a visit to Simo’s post. The most important thing it does is that it exposes a variable named ytTracker to the global namespace. From this variable, we will be able to call the functions ‘init’ and ‘digestPotentialVideos’ in the script at will. In short, this means that if we call ytTracker.init() at any point in time it will run the script again. This is, of course, exactly what we want for dynamically loaded videos. 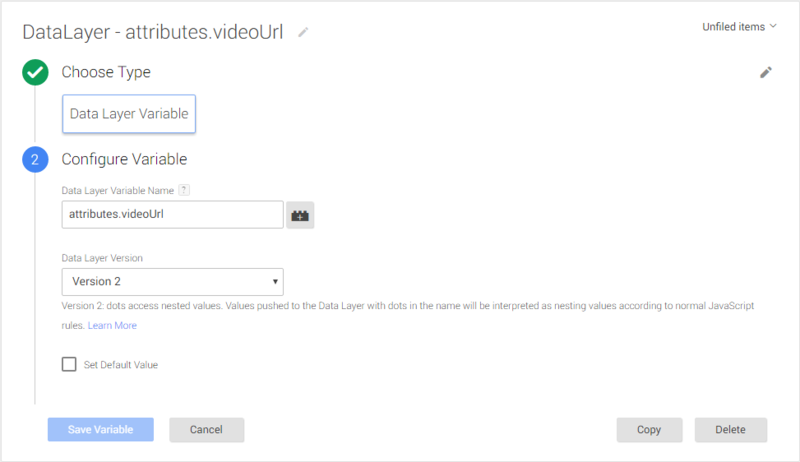 Under Configure Tag insert your Google Analytics Tracking ID, Chose Event as Track Type and set Category to Video. Under Action and Label choose the variables DataLayer – attributes.videoAction and DataLayer – attributes.videoUrl we created in step 2. Finally, you might want to give the action a value. 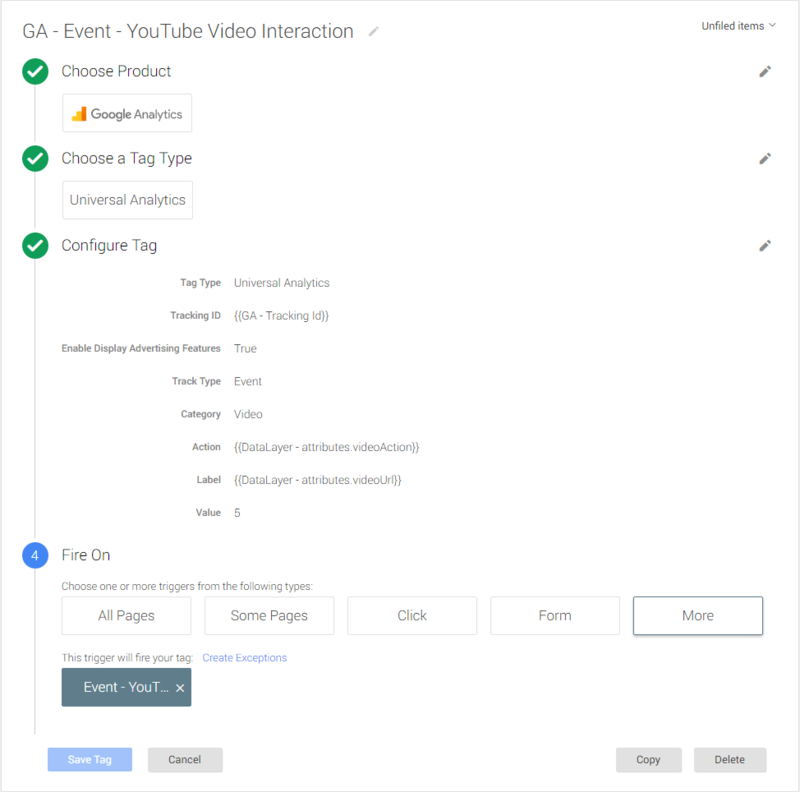 In the Fire On step, choose More and select the trigger named Event – YouTube Video Interaction that we created in step 3. The final tag should look somewhat like this. So on the case of popups with Magnific Popup the script could look like this (also using jQuery). This will target all of the following tags and make sure interactions with the respective videos will be tracked in Google Analytics. So to wrap up; this might seem like a lot of steps to track YouTube videos in Google Analytics with Google Tag Manager. However, it is pretty efficient and not that big a task. I’ve followed all of the steps but where can I view the results in Google Analytics? Hi Nathan, You should be able to see it under Behaviour > Events > Overview if you have set it up correctly. If you have no data you might want to debug with Google Tag Assistant. You can find it in the Crome web store. Is there a way to gather the video title as well? The Simo Ahava fix only works with the LunaMetrics method, but the LunaMetrics method doesn’t append the video title into the event label. Do you still need to do Step 5 if you’re only trying to track embedded YouTube videos? I was able to track youtube videos that are only embedded and had difficulties applying to videos that are loaded dynamically so thanks for this code Søren, much appreciated. Thank you for this post. Once I’ve done all the steps, i don’t understand how to do with the 5th step? Can i do with in Google Tag Manager or do I have to do anything else on the website? Then what do I have to do in order to see the events appears in analytics? I’m a begginer, I hope you can help me. I don’t understand step 5. Where should I put the script?? did you ever figure out where to put the script? I am having issues with Step 5 as well. I’m using YooTheme’s Widgetkit Lightbox. I tried putting the code on the page and in the script file. I keep getting an error that says, “ytTracker is not defined.” Any ideas? Hard to say. I would try to debug and see if this was available in the console by writing ytTracker when the page has loaded. It should return the ytTracker object. If it is not there you might want to look at your Tag Manager code and see if that is working. If it does return an object make sure that you don’t just call it on document ready. It probably has to be in a callback (as in step 5 in the example) as Tag Manager lazy loads it’s tags. I hope this guides you in the right direction. This post was extremely helpful! Thank you so much for putting it together. This is great. Thank you so much for posting. This is just what I was looking for. Is there a way to get the name of the video reported back to GTM?